This sqadia.com medical video lecture is all about airway management. Primarily, a procedure known as tracheostomy is discussed along with types of tracheostomy. After that permanent tracheostomy including high tracheostomy, mid tracheostomy, and low tracheostomy comes under consideration. Next is the postoperative care. Lastly, number of emergency procedures are illuminated such as laryngeal mask airway, transtracheal jet ventilation and laryngotomy. Tracheostomy is a procedure making an opening in anterior wall of trachea and converting it into stoma on skin surface. Functions of tracheostomy include protection to airways and provides alternative pathway for breathing. Three main indications of tracheostomy are respiratory obstruction, retained secretions, and respiratory insufficiency. 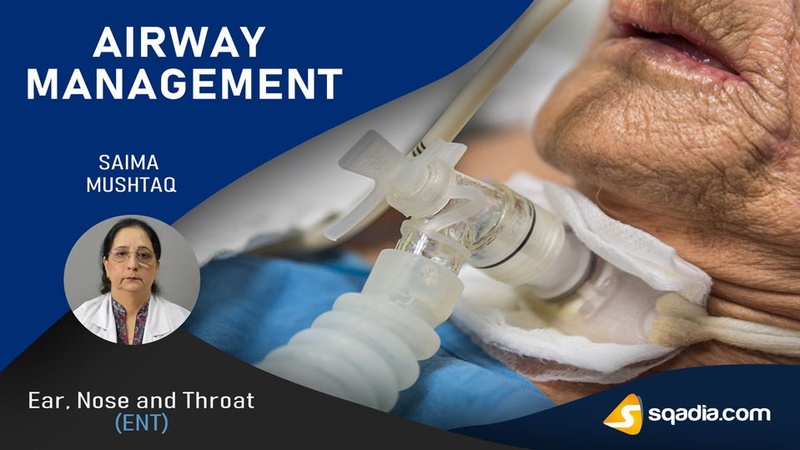 Emergency Tracheostomy is employed when airway obstruction is complete or almost complete. Elective tracheostomy is a planned and unhurried procedure. All operative surgical facilities are available. Among the types of elective tracheostomy, therapeutic elective tracheostomy is used to relieve respiratory obstruction and prophylactic elective tracheostomy guard against anticipated obstruction. Permanent tracheostomy is required for cases of bilateral abductor paralysis and laryngeal stenosis. 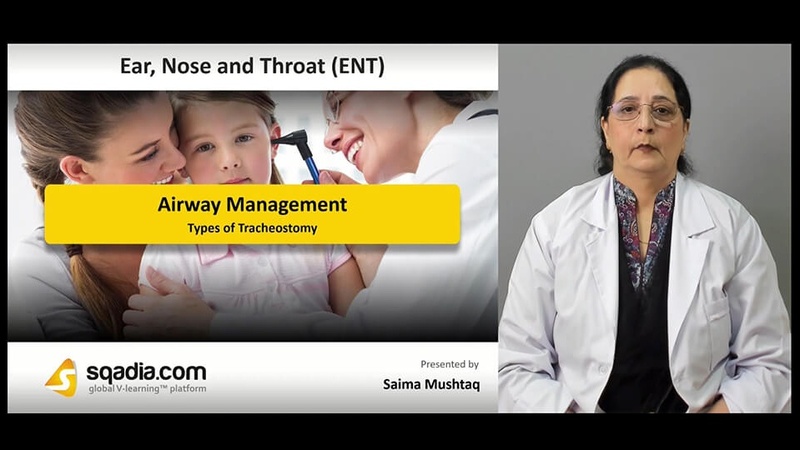 Then information of high tracheostomy, mid tracheostomy, and low tracheostomy is given by Dr. Saima Mushtaq. Then discussion continues on technique that how it could be done, what is the position for carrying out this procedure. Steps of operation are comprehensively elaborated. In postoperative care, constant supervision, suction, prevention of crusting and tracheitis, and care of tracheostomy tube is considered. Dr. Saima Mushtaq then talks about decannulation in detail. Also, decannulation in infant or young child is explained along with failure of decannulation. Immediate, intermediate, and late complications are pursued. Jaw thrust, oropharyngeal airway, nasopharyngeal airway, and endotracheal incubation are procedures for immediate airway management. Laryngeal mask airway is used for nonemergent airway control. Transtracheal jet ventilation is an invasive procedure. Some other procedures discussed in this section are cricothyrotomy or laryngotomy, mini tracheostomy, cricothyroid needle puncture, emergency tracheostomy, and percutaneous dilatational tracheostomy. Subsequently, their advantages, contraindications and complications are highlighted.